Modern society, no less than medieval society, craves order. While we no longer support the divine right of kings or the stratification of society into lords and serfs, we depend on guidelines, rules, and predictability. We expect the upward-pointing arrow to make the elevator rise and the downward-pointing arrow to make it descend. Women’s coats and shirts have buttons on the left, and men’s have buttons on the right. Penguins belong in and around Antarctica, not on the shores of Brazil. Explosions make noise in outer space, at least in the movies and on TV, even if we may know, deep down inside, that sound isn’t possible in a vacuum. Humanity has a gift for order, divinely granted: Genesis 2:19 states, “So out of the ground the Lord God formed every animal of the field, and every bird of the air, and brought them to the man to see what he would call them, and whatever the man called every living creature, that was its name.” This isn’t limited just to Judeo-Christian belief, either: from ancient times, virtually every religion states that the naming and ordering of things gives mankind power over them. David Weinberger, in his brilliant book, Everything is Miscellaneous, talks a great deal about order, starting with how a Staples office supply store is organized and venturing off into the periodic table of the elements, the alphabet, and the Dewey Decimal system for cataloging library books. Each system of order, formal or informal, is designed to solve a problem, from properly storing groceries fresh from the supermarket to keeping track of the millions of pieces necessary to assemble a Space Shuttle. And each system of order breaks down when new problems are presented or new goals are sought. The title describes the book very well. For any given task – laundry on washday, references for a scholarly paper on women poets of Byzantium, plane tickets to attend a wedding – there will be discrete piles of “things that go together” and then leftovers. For a given task, a given problem, there are useful items, and everything else is miscellaneous. That dry-clean-only blouse might be wonderful, but if you are washing white cotton clothing, it gets tossed into miscellaneous. The budget plane ticket to Reno might be a steal, but if the wedding is in Liverpool, it and all other flights are just miscellaneous. At another time, even minutes later, the blouse or the ticket to Reno might be critical, but not now. Sorting and categorizing are profoundly, deeply human activities. Consider, for example, solitaire. This, the world’s most popular game, with a vast range of permutations, is, quite literally, nothing but sorting. The World Wide Web presents the ultimate test of unstructured, unordered problem solving. Each day, countless gigabytes of new data are added to the Web, by millions of people around the world. Data is placed on the Web so that it can be found, and viewed, and used. But there is no gatekeeper for the Web, nor is there a grand classification scheme, nor even simple checks to see if the new data is genuinely new, or valid, or useful. There is no single set of problems that can be answered by things found on the World Wide Web. On the Web, everything is miscellaneous. Data, in and of itself, has no meaning; it needs context, and that context in turn needs to be applied to some problem or scope, at which point you can call it “information.” The number 7, for example, doesn’t mean anything until you happen to know it represents time. But is it 7 seconds, 7 hours, 7 p.m.? If you know it means 7 p.m., you haven’t made much progress, since 7 p.m. comes once every day to 24 different time zones around the world.. If you had just asked your spouse about the next showing of a movie you wanted to see, then “7” takes on meaning freighted with context: the movie will be shown at 7 p.m., and presumably your spouse is interested in seeing it, too, or otherwise they wouldn’t have had a ready response. This data about other data has a name: metadata. Mac users are intimately familiar with metadata, even if they aren’t aware of the term. An icon on the desktop is metadata: it is a visual clue about what kind of file or application or document should appear when you launch the file associated with the icon. The icon color, the name given below the icon, and possibly even where you’ve placed the icon on your desktop, all have potential meaning. Similarly, a song in iTunes has metadata. 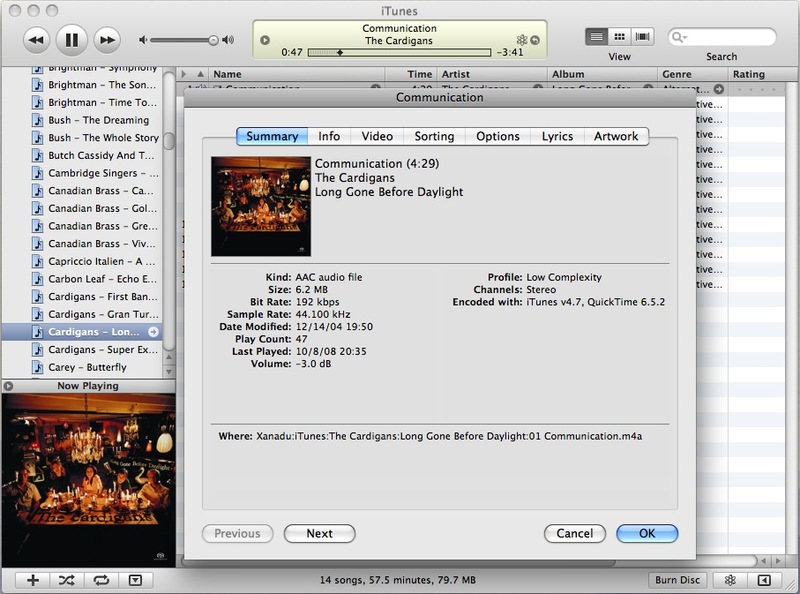 At a minimum, an iTunes listing provides name, time (length in minutes and seconds), artist, and album. Additionally, you may also have genre, rating (your rating of the song), play count, last played date, composer, track number, year (of release), album artwork, and a couple of dozen other attributes. iTunes revolutionized music classification. The normal browser window shows name, time, artist, album, genre, rating and a few other items. Selecting Get Info on a track tells you even more. iPhoto keeps track of metadata, too, but very different metadata. 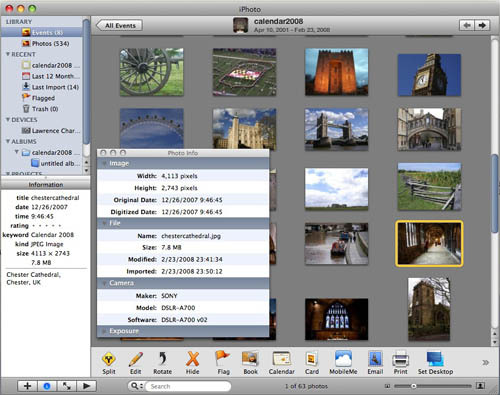 Photos and images are arranged by when they were imported, and iPhoto keeps track of image width, height, date the photo was taken (if a photo), name of photo, size (in bytes), date of importation (into iPhoto), date of modification (if modified), camera manufacturer, camera model, and software version of the camera. If you’ve bothered to annotate a photo, by writing a description, the photo gains additional metadata. iTunes and iPhoto data isn’t limited to a single machine, either. If you have multiple computers in a home or office (or dorm), iTunes libraries can be “published” on the network, and users on other machines can play music from your song library. If you publish photos on the Web with iPhoto, iPhoto will transfer much of the photo metadata to the pages, allowing others to view your photo notes as captions. iPhoto keeps track of a wealth of information about stored photos. In this case, a photo of Chester Cathedral is highlighted on the right, and the Information pane on the left shows the photo title, date and time the photo was taken, photo size, and annotation. Selecting Get Info would bring up additional information in the Photo Info window. Everything is Miscellaneous is essentially a book about everything, and nothing at all. It is a very approachable view of how humans solve problems through information gathering, and how wildly different systems have evolved for slicing and dicing information over human history. It will make you feel guilty about not assigning captions and keywords to photos in iPhoto, or saving word processing documents titled “Review” or “Minutes” or “Report” or something similarly bland and non-descriptive. It will make you appreciate Apple’s Spotlight desktop search engine, and Google. And it will expose you to some genuinely extraordinary methods of bringing order to the universe. David Weinberger, Everything is Miscellaneous: The power of the new digital disorder. Times Books, 2007. 277 pp. ; $25.00 ISBN 13-978-0-8050-8043-8. Also available in paperback.